Greetings, in the name of Christ, our Lord. 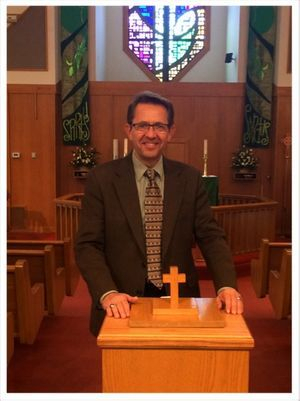 I'm the 'new guy' at Emmaus Lutheran Church, though, at 54, it's hard to feel particularly 'new' at much of anything anymore. My wife, Carol, and I moved here from Jacksonville, FL just after Christmas of 2013 and we couldn't be happier about the move or about the new ministry here with the wonderful people of Emmaus Lutheran and the communities surrounding our wonderful church. Carol is the Sr. Accountant for Stephen Ministries, a one-to-one care ministry based out of St. Louis, MO. Together, Carol and I love to go for long walks and bike rides. We love to cook and spend time with family and friends, and I think we'd spend every free minute at Disney World if we could. Between us, Carol and I have four children, Nicole, Stephanie (and her husband Atanas), Josh, and Ben. We are proud of our kids (all adults now), and we rejoice with them in all of their accomplishments. God is so good to us. He has given us the gift of life through the life and death and resurrection of his own Son. I believe it is incumbent on each of us to live out our Baptismal calling by sharing God's love with as many people as we possibly can find it in our hearts to touch. When people respond to this calling, God's Word is lived out daily and God's kingdom here on earth is strengthened. Thanks for reading this brief biography. Thank you for your prayers and your support of the ministry of Emmaus. We hope to see you soon in worship here.